Born in Berlin, Max Liebermann spent a formative period in Paris, then moved to Munich in 1878, before returning to Berlin in 1884. He became a leading figure in German Impressionism and was one of the founders of the Berlin Secession in 1889, of which he became the first President. A decade on, as one of the dominant figures in the German art scene, he was considered one of the establishment figures against whom the German Expressionists revolted. After the National Socialists came to power in Germany in 1933, Liebermann was obliged to resign as President of the Prussian Academy; he died two years later in 1935. In 1943, his wife, fearing Gestapo interrogation, committed suicide. In a chilling quirk of history, the Liebermann’s villa and studio at Wansee, a suburb of Berlin, was located next door to the house in which senior officials of the party gathered on 20 January 1942 to implement the Final Solution to 'the Jewish question'. 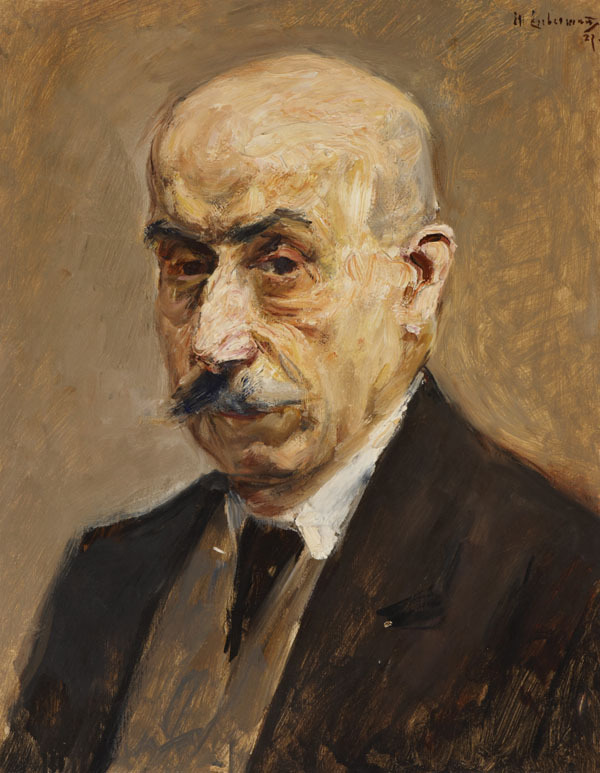 This self-portrait by the German-Jewish artist Max Liebermann was painted in 1927 when the artist was in his eighties. Portraiture was an integral part of Liebermann's repertoire, however in this late work he relinquished the vivid colour palette usually associated with the work of the Impressionists. Instead, his use of earthy colours testifies to the influence of the French Barbizon School during the 1870s. The majority of his portraits represent seated sitters in a three-quarter-length pose, but here his decision to adopt a bust-length pose allows him to engage more directly with the viewer.